Twin Sheet Molding (also known as twin sheet forming) combines the process disciplines of compression molding, blow molding, and vacuum forming to mold, laminate, and trim multiple layers of materials (substrates with cover stock) in a one step process. The twin sheet molding process forms two sheets of plastic simultaneously through the use of a separate mold on the top platen and a separate mold on the bottom platen. Once the plastic sheets have been vacuum formed, they remain in their respective molds. While both sheets still remain at their forming temperature, the two molds are brought together under high pressures and the two sheets are bonded together. The result is a single product with hollow areas requiring no secondary bonding. Although twin sheet molding has many advantages over competing processes, there are still restrictions and several different ways the twin sheet process can be accomplished. 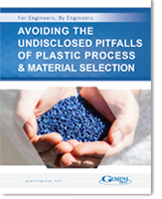 For more information on choosing the ideal process for your parts, download a free copy of Avoiding the Undisclosed Pitfalls of Plastic Process & Material Selection. Or you can contact us directly at 248-435-7271 or plasticsales@geminigroup.net.